The major subject theme here at CleverDude is Finances, but another reoccurring theme is Family (if you don’t believe me, just look at the web site header, haha!). If you’ve been reading here for awhile, you know that I have a teenage son. Kids tend to surprise you, sometimes even in a good way. Over the weekend was just one of those moments and it instantly occurred to me that it could be a reoccurring theme here at CleverDude. So here is my first installment of Shocking Teenager Moments! My son is knocking on the door of his fifteenth birthday, and in many ways he’s an average teenager. He’s growing at an inexplicable pace, eats copious amounts of food, his voice crackles at times, and he has the, â€œWhat do you know, you’re old!â€ eye roll perfected. On the other hand, he does his homework every night at 7:00pm without being told, gets straight A’s, and does his weekly responsibilities without grumbling. He’s a good kid with a good head on his shoulders, but what he said over the weekend surprised me. We were asking him for a few additional ideas for Christmas gifts to pass along to grandparents. We asked if he would like either a gift card to, or clothes from somewhere like Aeropostale, Abercrombie and Fitch, or some other mall clothing store that we perceived a teenager might be interested in. The statement make perfect sense to me, as I live by that same philosophy when I go clothes shopping. I want to look nice, but I have no interest in overpaying for an item just because it comes from a certain store, or because it has a specific name splashed across the front. But hearing that opinion expressed by a student in high school, where your social standing can be directly affected by the clothes you wear and the gadgets you happen to have, was refreshing. I don’t know when, or from what he formed this viewpoint. Maybe he heard me or his mother making similar statements, maybe he came up with it on his own, or maybe a little of both, but I couldn’t help but smiling when he said it. 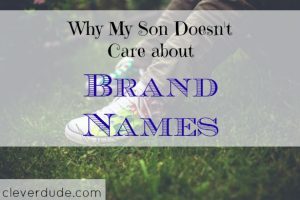 I’m proud that my son is aware of the concept of value, and how retailers gorge customers to pay for a name, and not necessarily for quality. Shocking teenager moment, proud daddy moment. Of course, just as I’m finishing up this post, my son came down the stairs and told me he needed a new yellow notebook for school. Today. Superdad was unable to make a yellow notebook appear out of thin air, nor was I able to get to Walmart and back in the 5 minutes available before he had to head out to the bus stop. I got the eye roll indicating that this was somehow my fault. He’ll have to make due with the half used black notebook I found in a drawer until tomorrow. Have you been shocked by anything your kids have said lately? His statement is SO true.The funny thing is, so many brands make clothes without logos on them but that you can still tell is the brand. I know an Abercrombie dress when I see one. It’s great to see teenagers that don’t care about brands. That is AWESOME! I’m holding on to the hope that my son still feels that way in a few years. Right now, virtually all his clothes are hand-me-downs or Village Thrift 1/2 price Monday deals. Don’t discount your influence on him. Kids do pay attention and learn from us – the good and the bad! @Cathie – I agree that kids absorb more than we think they do. I just hope he doesn’t pick up on some of my bad habits. lol. We held on to using second hand stores as long as we could….eventually we started getting reluctance to wear the gently used clothes. Thanks for reading, Cathie!